Admittedly, office work sounds dull if you're looking for adventure on the high seas (and I've met a few people who feel that way even after they chose to enlist in clerical occupations.) But becoming a yeoman—naval lingo for administrator—doesn't have to be dull if you've got killer organizational and writing skills, a positive attitude, and the guts to push for the exciting assignments (they're out there.) And of course, in an organization as immense as the US Navy, there'd be no way to keep the wheels turning, the ships sailing, and the paychecks coming without dedicated workers behind the scenes. Yeoman may work in an office environment on ship or shore, and handle numerous administrative tasks. According to the yeoman rating card at Navy Credentialing Opportunities On-Line (COOL), these duties include "preparing, typing and routing correspondence and reports; organizing and maintaining files; receiving office visits and handling telephone communications; operating personal computers and other office machines; performing office personnel administration; maintaining records and official publications; [and] performing administrative functions for legal proceedings." In addition to staying in the YN field, yeoman may opt to move into career specializations such as Legalman and Career Counselor. If it all sounds the same as getting a temp job at the local insurance office, don't worry: Yeomen are still sailors. In fact, the Navy COOL yeoman rating card also estimates that as of October 2012, the average YN will spend about 40% of his or her career "assigned to fleet units" -- in other words, assignments where they'll be expected to shove off from port and get some fresh salt air. Like all Navy recruits, enlistees for the yeoman rating must be high school-educated and pass the Armed Services Vocational Aptitude Battery (ASVAB.) Navy recruiters look at the total of verbal expression and mechanical knowledge scores and consider anyone with a total over 105 qualified for the rating, according to Rod Powers. Alternately, those with a low score in either of those sections may also be considered if adding the score for coding speed brings the total to 157 or higher. For security purposes, recruits must submit to a background check and prove eligible for a secret clearance. US citizenship is also required, and sailors must achieve a typing speed of at least 40 words per minute by the time they're done with job training. Yeomen may be desk-jockeys, but they're still seafaring men and women and must learn to perform the part in Navy boot camp in Great Lakes, Illinois. Afterward, newly-minted sailors head down to the opposite end of the Mississippi for seven weeks of "A" school at the Naval Technical Training Center (NTTC) Naval Air Station Meridian. I have to admit that, other than the usual requirements for physical training and standing watch, yeoman school at the NTTC sounds pretty laid-back (but don't quote me on that.) The NTTC website describes training as "self-paced" using a combination of computer-based coursework and simulated on-the-job training. Sailors who dive for the submarine program (Get it? "Dive?") attend an additional month of training at the Basic Enlisted Submarine School in Groton, Connecticut. 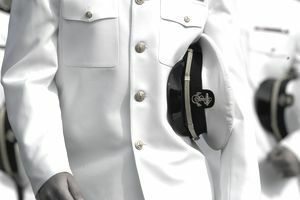 Depending on their duties and experience, yeoman who advance to the petty officer ranks (E-4 and above) may also be eligible to log hours with the United Services Military Apprenticeship Program (USMAP) for progress toward becoming a journeyman apprentice legal secretary, computer operator, or office manager. What Is a Navy Gunner's Mate? Do You Have What It Takes to Be a Navy Damage Controlman?